The F136, commonly known as Ferrari-Maserati engine, is a family of 90° V8 petrol engines jointly developed by Ferrari and Maserati and produced by Ferrari; these engines displace between 4.2 L and 4.7 L, and produce between 390 PS (287 kW; 385 hp) and to 605 PS (445 kW; 597 hp). All engines are naturally aspirated, incorporate dual overhead camshafts, variable valve timing, and four valves per cylinder. The architecture has been produced in various configurations for cars under those badges as well as for a single Alfa Romeo model. All three companies are owned by Fiat Chrysler Automobiles, formerly Fiat S.p.A. under whom the engine sharing program was organized. Starting with the 2013 Maserati Quattroporte GTS, and following with the 2014 Ferrari California T, the F136 is being replaced by the new twin turbocharged Ferrari F154 V8 engine. Maserati and Alfa Romeo versions have crossplane crankshafts, while Ferrari versions are flat plane. The F136 engine family has won a total of 8 awards in the International Engine of the Year competition. The F136 FB engine variant was awarded "Best Performance Engine" and "Above 4.0 litre" recognitions in 2011 and 2012, while the F136 FL variant won the same categories in 2014 and 2015. ^ "Alfa Range Brochure" (PDF). alfaromeo.co.uk. Archived from the original (PDF) on 10 August 2011. Retrieved 22 April 2009. ^ "Ferrari tech page on the flat-crank v8". Retrieved 8 August 2012. ^ "CR Scuderia". CR Scuderia. Retrieved 11 Sep 2009. ^ "A1GP". A1 Holdings Limited. Archived from the original on 5 October 2009. Retrieved 29 September 2009. A V8 engine is an eight-cylinder V configuration engine with the cylinders mounted on the crankcase in two sets of four, with all eight pistons driving a common crankshaft. Most banks are set at an angle to each other, some at a narrower angle, with 45°, 60°. In its simplest form, the V8 is basically two parallel inline-four engines sharing a common crankshaft, since the 1920s, most V8s have used the somewhat more complex crossplane crankshaft with heavy counterweights to eliminate the vibrations. This results in an engine that is smoother than a V6, most racing V8s continue to use the single plane crankshaft because it allows faster acceleration and more efficient exhaust system designs. In 1902, Léon Levavasseur took out a patent on a light and he called it the Antoinette after the young daughter of his financial backer. From 1904 he installed this engine in a number of competition speedboats, the aviation pioneer Alberto Santos-Dumont saw one of these boats in Côte dAzur and decided to try it on his 14-bis aircraft. Its early 24 hp at 1400 rpm version with only 55 kg of weight was interesting, Santos-Dumont ordered a larger and more powerful version from Levavasseur. He changed its dimensions from the original 80 mm stroke and 80 mm bore to 105 mm stroke and 110 mm bore, obtaining 50 hp with 86 kg of weight and its power-to-weight ratio was not surpassed for 25 years. Levavasseur eventually produced its own line of V8 equipped aircraft, named Antoinette I to VIII, hubert Latham piloted the V8 powered Antoinette IV and Antoinette VII in July 1909 on two failed attempts to cross the English Channel. However, in 1910, Latham used the VII with the engine to become the first in the world to reach an altitude of 3600 feet. Voisin constructed pusher biplanes with Antoinette engines, notably the one first flown successfully by Henry Farman in 1908, the V8 engine configuration became popular in France from 1904 onward, and was used in a number of aircraft engines introduced by Renault, and Buchet among others. The Maserati Quattroporte is a four-door sports luxury saloon produced by Italian car manufacturer Maserati. The name translated from Italian literally means four doors, there have been six generations of this car, with the first introduced in 1963, and the current model launched in 2013. The original Maserati Quattroporte was built between 1963 and 1969 and it was a large saloon car powered by V8 engines—both firsts for a series production Maserati. 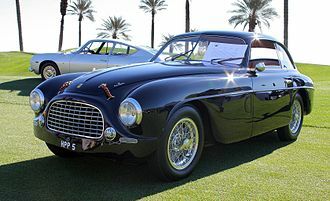 The task of styling the Quattroporte was given to Turinese coachbuilder Pietro Frua, while the design was by Frua, body construction was carried out by Vignale. The Quattroporte was introduced at the October-November 1963 Turin Motor Show, the Tipo 107 Quattroporte joined two other grand tourers, the Facel Vega and the Lagonda Rapide, capable of traveling at 200 km/h on the new motorways in Europe. It was equipped with a 4. 1-litre V8 engine, producing 260 hp DIN at 5,000 rpm, Maserati claimed a top speed of 230 km/h. The car was exported to the United States, where federal regulations mandated twin round headlamps in place of the single rectangular ones found on European models. Between 1963 and 1966,230 units were made, in 1966, Maserati revised the Tipo 107, adding the twin headlights already used on the U. S. model. A leaf-sprung solid axle took place of the previous De Dion tube, the interior was completely redesigned, including the dashboard which now had a full width wood-trimmed fascia. 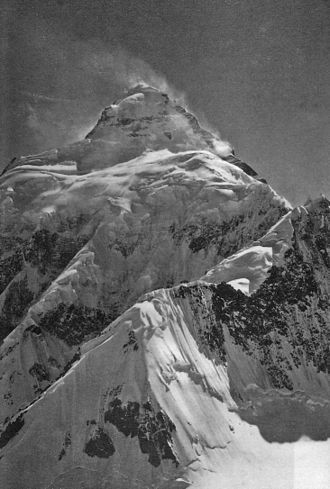 In 1968 alongside the 4. 1-litre a 4. 7-litre version became available, top speed increased to a claimed 255 km/h, making the Quattroporte 4700 the fastest four-door saloon in the world at the time. Around 500 of the series were made, for a total of 776 Tipo 107 Quattroportes. The first generation Quattroporte had a unibody structure, complemented by a front subframe. 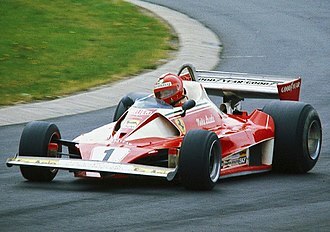 Front suspension was independent, with springs and hydraulic dampers. On both axles there were anti-roll bars, brakes were solid Girling discs all around. A limited slip differential was optional, the long lived quad cam, all-aluminium Maserati V8 engine made its début on the Quattroporte. In 1971, Karim Aga Khan ordered another special on the Maserati Indy platform, rory Brown was the chief engineer. The Ferrari F430 is a sports car that was produced by the Italian car manufacturer Ferrari from 2004 to 2009. A successor to the Ferrari 360, it debuted at the 2004 Paris Motor Show and its successor, the Ferrari 458, was unveiled on 28 July 2009. Designed by Pininfarina, under the guidance of Frank Stephenson, the styling of the F430 was revised from its predecessor. Although the drag coefficient remained the same, downforce was greatly enhanced, despite sharing the same basic Alcoa Aluminium chassis, roof line and glass, the car looked significantly different from the 360. A great deal of Ferrari heritage was included in the exterior design, at the rear, the Enzos tail lights and interior vents were added. The cars name was etched into the Testarossa-styled drivers side mirror, the large oval openings in the front bumper are reminiscent of Ferrari racing models from the 60s, specifically the 156 sharknose Formula One car and 250 TR61 Le Mans cars of Phil Hill. The F430 features a 4. 3L V8 petrol engine of the Ferrari-Maserati F136 family and this new power plant was a significant departure for Ferrari, as all previous Ferrari V8s were descendants of the Dino racing program of the 1950s. This fifty-year development cycle came to an end with the entirely new 4. 3L, the engines output specifications are,490 PS, at 8500 rpm and 465 N·m of torque at 5250 rpm, 80% of which is available below 3500rpm. Despite a 20% increase in displacement, engine weight grew by only 4 kg and engine dimensions were decreased, the brakes on the F430 were designed in close cooperation with Brembo and Bosch, resulting in a new cast-iron alloy for the discs. The new alloy includes molybdenum which has better heat dissipation performance, the F430 was available with the optional Carbon fibre-reinforced Silicon Carbide ceramic composite brake package. Ferrari claims the carbon ceramic brakes will not fade even after 300-360 laps at their test track, the F430 featured the E-Diff, a computer-controlled limited slip active differential which can vary the distribution of torque based on inputs such as steering angle and lateral acceleration. Other notable features include the first application of Ferraris manettino steering wheel-mounted control knob, drivers can select from five different settings which modify the vehicles ESC system, Skyhook electronic suspension, transmission behavior, throttle response, and E-Diff. Twin-turbo or biturbo refers to a turbocharged engine in which two turbochargers compress the intake charge. Other kinds of turbocharging include sequential turbocharging, and staged turbocharging, the latter is used in diesel automobile racing applications. Paralleled twin-turbo refers to the configuration in which two identical turbochargers function simultaneously, splitting the turbocharging duties equally. Each turbocharger is driven by half of the engines spent exhaust energy, in most applications, the compressed air from both turbos is combined in a common intake manifold and sent to the individual cylinders. Usually, each turbocharger is mounted to its own individual exhaust/turbo manifold, parallel twin turbos applied to V-shaped engines are usually mounted with one turbo assigned to each cylinder bank, providing packaging symmetry and simplifying plumbing over a single turbo setup. When used on engines, parallel twin turbos are commonly applied with two smaller turbos, which can provide similar performance with less turbo lag than a single larger turbo. Some examples of parallel twin-turbo inline engines are Nissans RB26DETT, BMWs N54, some examples of V formation engines with parallel twin-turbos include Mitsubishis 6A12TT, 6A13TT and 6G72TT, Nissans VG30DETT and VR38DETT, and Audis 1997-2002 S4, 1997-2005 A6, and 2003-2004 RS6. While a parallel twin-turbo set-up theoretically has less lag than a single turbocharger set up. Some ways to counter this are to use a pressure set up with smaller turbos. While this setup sacrifices some top end power, it still has less lag than an engine with a single turbo set up making the same power. Another system would be the use of variable geometry turbochargers and this system changes the angle of the guide vanes depending on the exhaust pressure, giving the system excellent power throughout the rev range. Once used mainly in turbocharged engines, Chrysler was the first to use it in mass-production gasoline-powered vehicles with the Shelby CSX. It is possible to use parallel operation with more than two turbochargers, two such examples are the Bugatti EB110 and Bugatti Veyron, both of which run four turbochargers in parallel. Directly injecting fuel into the combustion chamber requires high-pressure injection, whereas low pressure is used injecting into the intake tract or cylinder port. In some applications, gasoline direct injection enables a stratified charge combustion for improved fuel efficiency. GDI has seen rapid adoption by the industry over the past years. The major advantages of a GDI engine are increased fuel efficiency, emissions levels can be more accurately controlled with the GDI system. The cited gains are achieved by the control over the amount of fuel. In addition some engines operate on full air intake and this means there is no air throttle plate, which greatly improves efficiency, and reduces piston pumping losses. It eliminates air throttling losses in some GDI engines, when compared with conventional fuel-injected or carbureted engines, the engine management system continually chooses among three combustion modes, ultra lean burn and full power output. Each mode is characterized by the air-fuel ratio, the stoichiometric air-fuel ratio for gasoline is 14.7,1 by weight, but ultra lean mode can involve ratios as high as 65,1. These mixtures are much leaner than in an engine and reduce fuel consumption considerably. Ultra lean burn or stratified charge mode is used for light-load running conditions, at constant or reducing road speeds, the fuel is not injected at the intake stroke but rather at the latter stages of the compression stroke. The cavity creates the effect so that the small amount of air-fuel mixture is optimally placed near the spark plug. This stratified charge is surrounded mostly by air and residual gases, which keeps the fuel, decreased combustion temperature allows for lowest emissions and heat losses and increases air quantity by reducing dilation, which delivers additional power. This technique enables the use of mixtures that would be impossible with carburetors or conventional fuel injection. Stoichiometric mode is used for moderate load conditions, fuel is injected during the intake stroke, creating a homogeneous fuel-air mixture in the cylinder. From the stoichiometric ratio, an optimum burn results in a clean exhaust emission, full power mode is used for rapid acceleration and heavy loads. The Ferrari Dino engine is a line of mechanically similar V6 and V8 engines produced by Ferrari for the past 40 years Alfredo Dino Ferrari, was the son of Enzo Ferrari. Dino suggested to Enzo Ferrari the development of a V6 engine for F2 at the end of 1955, soon afterwards, Alfredo fell ill, suffering from muscular dystrophy. While in hospital, he discussed technical details with the engineer Vittorio Jano, Dino would never see the engine, he died on June 30,1956 at the age of 24. The Dino V6 was Ferraris first V6 engine, the Dino V8 engine was introduced later. The V8 engines all used a crankshaft configuration. The production Dino V6 began as a discussion between Vittorio Jano and Enzo and Dino Ferrari about the ideal 1.5 L engine for use in the 1958 Formula Two auto racing series. Jano, formerly of Alfa Romeo and Lancia, pressed for a conventional 60° V6 but the Ferraris were open-minded. Janos 60° design incorporated some of his ideas from the Lancia Aurelia, and were used in a number of Formula One, Formula Two, appearing in 1958, it used a 77x71 mm bore and stroke for 1984 cc and produced 200 hp in the 196 S.
Two larger versions were produced, the 245 hp 2497 cc 246 S and 296 hp 2962 cc 296 S. These engines continued in the 1962196 SP and 286 SP, the latter had a 90 mm bore and 75 mm stroke for 2863 cc and 260 hp. This engine was so small that very little room was available for smooth intake tracts, the Ferraris were convinced that a freer-flowing intake could result in more power, so a new design was called for. Ferrari designers began work on the first Dino V6 engine in 1956 and this engine was installed in the Ferrari 156 F2 car and was first raced in the Grand Prix of Naples in April 1957, where it finished in third place behind two Lancia-Ferrari V8 Formula One cars. The result of the creativity was the worlds only 65° V6 engine. 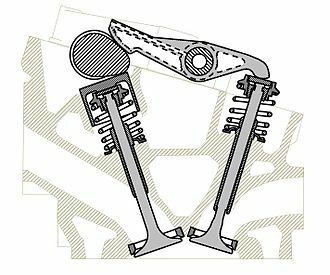 The extra 5° between cylinder banks gave Ferrari the straight intakes he wanted, as this engine was not a true V6 but had a separate crank pin for every connecting rod, the crank pins were offset by 55 degrees within every pair of cylinders. This ensured an even firing order for the engine as well as an even distance between firing pulses per cylinder bank. The Fiat Group contained many brands such as Ferrari, Fiat, Alfa Romeo, the Chrysler Group, and many more. On 29 January 2014, it was announced that Fiat S. p. A. was to be merged into a new Netherlands-based holding company Fiat Chrysler Automobiles NV, Fiat Chrysler Automobiles became the new owner of Fiat Group. On 1 August 2014, Fiat S. p. A. received necessary shareholder approval to proceed with the merger, the merger became effective 12 October 2014. Fiat was founded in 1899 by a group of investors, including Giovanni Agnelli, during its more than century-long history, Fiat has manufactured railway engines and carriages, military vehicles, farm tractors, and aircraft. In 2013, Fiat was the second largest European automaker by volumes produced, and the seventh in the world ahead of Honda, PSA Peugeot Citroën, Suzuki and Daimler AG. Fiat Group currently produces vehicles under twelve brands, Alfa Romeo, Dodge, Fiat, Fiat Professional, Lancia, Ram Trucks, and SRT. In 1970, Fiat employed more than 100,000 in Italy when its production reached the highest number,1.4 million cars, in that country. As of 2002, Fiat built more than 1 million vehicles at six plants in Italy, fiat-brand cars are built in several locations around the world. Outside Italy, the largest country of production is Brazil, where the Fiat brand is the market leader, the group has factories in Argentina and Mexico and a long history of licensing manufacture of its products in other countries. It has alliances and joint ventures around the world. He was succeeded briefly by Paolo Fresco, who served as chairman, Umberto Agnelli took over as chairman from 2003 to 2004. After Umberto Agnellis death on 28 May 2004, Luca Cordero di Montezemolo was named chairman, with Agnelli heir John Elkann becoming vice chairman, on 1 June 2004, Giuseppe Morchio was replaced by Sergio Marchionne as CEO. Giovanni Agnelli, with investors, founded the Fabbrica Italiana Automobili Torino società per azioni. Its acronymous name was changed to upper- and lower-case Fiat in 1906, Agnelli led the company until his death in 1945, while Vittorio Valletta administered the firms daily activities. The Ferrari California is a grand touring sports car produced by the Italian manufacturer Ferrari. It is a two-door 2+2 hard top convertible, the car revives the name used on the late-1950s Ferrari 250 GT Spyder California and the 1960s 365 California. It is noted in being the least expensive model in the Ferrari range, the California was launched at the 2008 Paris Motor Show. The California represents a new, fourth model range for the company, the engine displaces 4,297 cubic centimetres, and used gasoline direct injection. It delivers 338 kW at 7,750 rpm, its maximum torque produced is 485 N·m at 5,000 rpm, the body computer system was developed by Magneti Marelli Automotive Lighting. The original 2010 California had a top speed of 310 km/h, although that model was 180 kilograms heavier and 30 PS less powerful than the mid-engined F430, the California reached 97 km/h in the same time as the F430 due to the dual-clutch transmission. 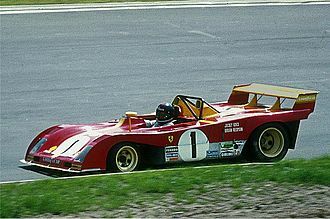 Ferrari spent over 1,000 hours in the tunnel with a one-third-scale model of the California perfecting its aerodynamics. With the top up, the California has a coefficient of Cd=0.32. The California is built in a new production line adjacent to the factory at Maranello. The existing production line produces 27 cars per day, or 6,000 per year, throughout the Californias production, only 3 cars had been built with manual transmission, including one order from the UK. On 15 February 2012, Ferrari announced an upgrade of the 2009 model which is lighter, the car was released at the 2012 Geneva Motor Show as a 2012 model in Europe and as a 2013 model year for the US. To give the clients a more dynamic driving experience, an optional HS package was developed as part of the update in 2012 and it can be recognized by a silver coloured grille and ventilation blisters behind the front wheel wells. In May 2012, Ferrari recalled the California because the engine could freeze suddenly and possibly cause a crash, the F136 engines had crankshafts that were machined incorrectly. The auto maker learned of the problem when it happened during a review by car critics. Maserati is an Italian luxury vehicle manufacturer established on 1 December 1914, in Bologna. 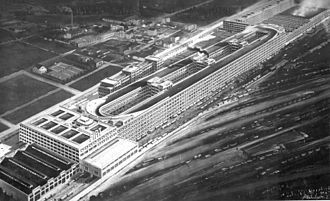 The companys headquarters are now in Modena, and its emblem is a trident and it has been owned by the Italian-American car giant Fiat Chrysler Automobiles and FCAs Italian predecessor Fiat S. p. A. since 1993. In May 2014, due to plans and product launches. This caused them to production of the Quattroporte and Ghibli models. Maserati is placing a production output cap at 75,000 vehicles globally, the Maserati brothers, Bindo, Carlo and Ernesto were all involved with automobiles from the beginning of the 20th century. Alfieri and Ernesto built 2-litre Grand Prix cars for Diatto, in 1926, Diatto suspended the production of race cars, leading to the creation of the first Maserati and the founding of the Maserati marque. One of the first Maseratis, driven by Alfieri, won the 1926 Targa Florio, Maserati began making race cars with 4,6,8 and 16 cylinders. The trident logo of the Maserati car company is based on the Fountain of Neptune in Bolognas Piazza Maggiore, in 1920, one of the Maserati brothers, artist Mario, used this symbol in the logo at the suggestion of family friend Marquis Diego de Sterlich. Alfieri Maserati died in 1932, but three brothers, Bindo and Ettore, kept the firm going, building cars that won races. The brothers continued in engineering roles with the company, Racing successes continued, even against the giants of German racing, Auto Union and Mercedes. In back-to-back wins in 1939 and 1940, a Maserati 8CTF won the Indianapolis 500, the war intervened, Maserati abandoned car making to produce components for the Italian war effort. During this time, Maserati worked in fierce competition to construct a V16 town car for Benito Mussolini before Ferry Porsche of Volkswagen built one for Adolf Hitler and this failed, and the plans were scrapped. Once peace was restored, Maserati returned to making cars, the Maserati A6 series did well in the racing scene. Key people joined the Maserati team, alberto Massimino, an old Fiat engineer, with both Alfa Romeo and Ferrari experiences oversaw the design of all racing models for the next ten years. With him joined engineers Giulio Alfieri, Vittorio Bellentani, and Gioacchino Colombo, the focus was on the best engines and chassis to succeed in car racing. A crankshaft—related to crank—is a mechanical part able to perform a conversion between reciprocating motion and rotational motion. In a reciprocating engine, it translates reciprocating motion of the piston into rotational motion, whereas in a reciprocating compressor, a Roman iron crank of yet unknown purpose dating to the 2nd century AD was excavated in Augusta Raurica, Switzerland. The 82.5 cm long piece has fitted to one end a 15 cm long bronze handle, the accompanying inscription is in Greek. The crank and connecting rod mechanisms of the other two archaeologically attested sawmills worked without a gear train, al-Jazari described a crank and connecting rod system in a rotating machine in two of his water-raising machines. His twin-cylinder pump incorporated a crankshaft, though the device was unnecessarily complex, the Italian physician Guido da Vigevano, planning for a new crusade, made illustrations for a paddle boat and war carriages that were propelled by manually turned compound cranks and gear wheels. In Renaissance Italy, the earliest evidence of a crank and connecting-rod is found in the sketch books of Taccola. A sound grasp of the motion involved is demonstrated a little by Pisanello. One of the drawings of the Anonymous of the Hussite Wars shows a boat with a pair of paddle-wheels at each end turned by men operating compound cranks. Crankshafts were described by Konrad Kyeser, Leonardo da Vinci and his wind-powered sawmill used a crankshaft to convert a windmills circular motion into a back-and-forward motion powering the saw. 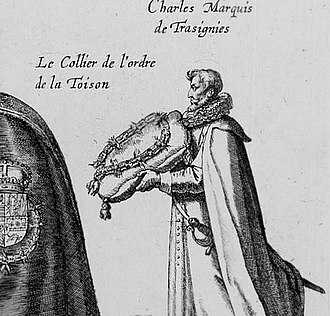 Corneliszoon was granted a patent for his crankshaft in 1597, large engines are usually multicylinder to reduce pulsations from individual firing strokes, with more than one piston attached to a complex crankshaft. Many small engines, such as found in mopeds or garden machinery, are single cylinder and use only a single piston. A crankshaft is subjected to stresses, potentially equivalent of several tonnes of force. The crankshaft is connected to the fly-wheel, the block, using bearings on the main journals. The automotive industry is a wide range of companies and organizations involved in the design, manufacturing and selling of motor vehicles, some of them are called automakers. It is one of the worlds most important economic sectors by revenue, the term automotive was created from Greek autos, and Latin motivus to represent any form of self-powered vehicle. This term was proposed by Elmer Sperry, the automotive industry began in the 1890s with hundreds of manufacturers that pioneered the horseless carriage. For many decades, the United States led the world in automobile production. In 1929, before the Great Depression, the world had 32,028,500 automobiles in use, at that time the U. S. had one car per 4.87 persons. After World War II, the U. S. produced about 75 percent of auto production. In 1980, the U. S. was overtaken by Japan, in 2006, Japan narrowly passed the U. S. in production and held this rank until 2009, when China took the top spot with 13.8 million units. With 19.3 million units manufactured in 2012, China almost doubled the U. S. production, with 10.3 million units, from 1970 over 1998 to 2012, the number of automobile models in the U. S. has grown exponentially. Safety is a state that implies to be protected from any risk, danger, in the automotive industry, safety means that users, operators or manufacturers do not face any risk or danger coming from the motor vehicle or its spare parts. Safety for the automobiles themselves, implies there is no risk of damage. Safety in the industry is particularly important and therefore highly regulated. Automobiles and other vehicles have to comply with a certain number of norms and regulations, whether local or international. The standard ISO26262, is considered as one of the best practice framework for achieving automotive functional safety. In case of safety issues, product defect or faulty procedure during the manufacturing of the motor vehicle and this procedure is called product recall. Product recalls happen in every industry and can be production-related or stem from the raw material, the automotive industry is still particularly concerned about product recalls, which cause considerable financial consequences. Experimental Liberty V8 aircraft engine shows its 45° V-shaped configuration when looking at it from the front or back. Automotive versions usually use a wider, 90° block angle. A Honda D15A3 series single overhead camshaft cylinder head from a 1987 Honda CRX 4 cylinder 12 valve. 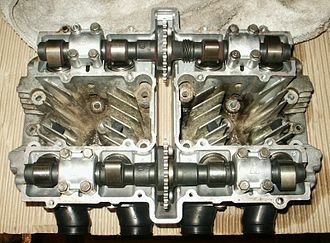 Section of a Triumph Dolomite Sprint cylinder head, highlighting the single cam operating both inlet (directly) and exhaust (through a rocker arm) valves. Overhead view of Suzuki GS550 cylinder head showing double camshafts and chain-drive sprockets. The Indian Point Energy Center. Over a billion fish eggs and larvae are killed in its cooling system each year. An antique gasoline engine with an evaporative cooler and mesh screen to improve evaporation. Water is pumped up to the top and flows down the screen to the tank. Juan-Manuel Fangio driving a Maserati 250F. A 1908 Darracq 8/10 HP assembled by Alfa Romeo's predecessor, Darracq Italiana. 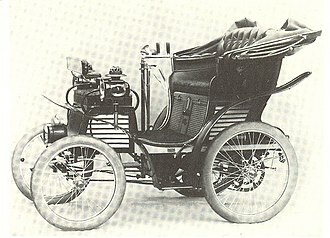 The A.L.F.A 24 hp (this is with Castagna torpedo body) was the first car made by Anonima Lombarda Fabbrica Automobili (A.L.F.A) in 1910. Cutaway model of Subaru's i-AVLS variable valve timing system on SOHC 4-valve-per-cylinder EJ25 boxer engine at Tokyo Motor Show 2007. 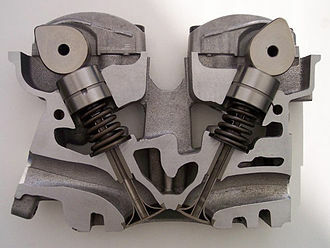 Combustion chamber of a 2009 Ford Ecoboost 3.5-liter turbocharged V6 petrol engine (77.8 kW/liter) showing two intake valves (right), two exhaust valves (left), centrally placed spark plug, and direct fuel injector (right). A cylinder from an air-cooled aviation engine, a Continental C85. Notice the rows of fins on both the steel cylinder barrel and the aluminum cylinder head. The fins provide additional surface area for air to pass over the cylinder and absorb heat. 3d model of a cross-plane crankshaft demonstrating the 90 degree angle between the crank throws. Gasoline direct injection engine prototype. Oscillating Poppet Valve on one of Chapelon's rebuilt 4-6-2 locomotives. Nearly 300 variations of diamond color exhibited at the Aurora display at the Natural History Museum in London. Insignia of a Knight of the Order of the Golden Fleece of Spain. Modern manufacture, Cejalvo (Madrid). Frieze detail from internal courtyard showing Queen Victoria in front of the 1851 Great Exhibition. One of Ranjit Singh's favourite horses with the head of his stables. 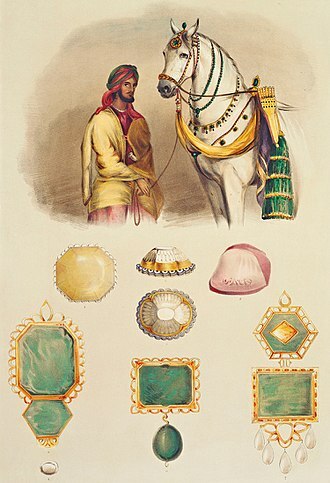 His jewels are shown, to scale, including the Koh-i-Noor (top centre). Diagram of the pre-1852 cut. Fig I. Shaded area is the base. Fig II. A: flaw; B and C: notches cut to hold stone in a setting; D: flaw created by fracture at E; F: fracture created by a blow; G: unpolished cleavage plane; H: basal cleavage plane. Fig III. 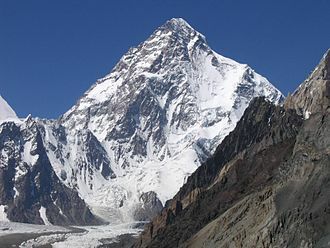 Opposite side, showing facets and peak of the "Mountain of Light"
The Napoleon Diamond Necklace on display at the Smithsonian Institution in Washington, D.C.